Our custom upholstered Bar Stools, Chairs, and Tables are built to last for years in your home or restaurant. Our restaurant bar stools and diner furniture are built by US based manufacturers with proven reputations in the hospitality field. Our feeling is that if a chair can last at the counter of a 24 hour diner, it can last pretty much anywhere. We have many items at ridiculously low prices. See our discount bar stools. Each bar stool, table, and chair can be made IN ANY COLOR. We carry dinette sets and retro bar furniture and diner furniture including retro bar stools, retro tables, counter stools, retro booths, and diner chairs. We have one of the largest selections of chrome diner chairs and bar stools online. Whether you are planning to use our retro furniture in your restaurant or in your home, you will be pleased with the look and the durability of all the chrome bar stools that we sell. All upholstery work is done in the USA. 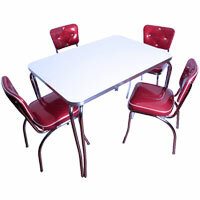 Add some retro flair to your home with a brand new 1950s style table and chair dinette set. We carry only the finest quality commercial bar furnishings and diner furniture. Our lines of bar and diner furniture consist of commercial bar stools, diner chairs, soda fountain counter stools, and tables. Our bar stools can be used as restaurant stools, guitar bar stools, shops stools, and diner stools. Retro bar stools and retro kitchen chairs are back in a big way! Now you can afford the best discount bar stools and accent with a diner chair. We make it easy to find kitchen bar stools that will accentuate your decor. It's easy to tell them who you are with a great logo bar stool that utilizes your very own design. When it comes to chrome furniture, restaurant bar stools, and club chairs we can help you find exactly what you need for the best price available. All of our bar stools are commercial bar stools. Our diner tables will last for decades when upholstered in cracked ice vinyl. Your guests will also appreciate the comfort of a club chair from our wide selection. Great style calls for the finest in diner bar stools and other bar furniture. Read on to learn more about our selection process, great customer service, and quick delivery. Now featuring bar stool covers and bar stool seat covers! Check out our cheap bar stools.